Everybody loves the story of an underdog coming out on top. Imagine a boxer in his first heavyweight fight going against the world champion of the world. Heading into Super Bowl week, that is exactly what this matchup was hyped up to be. This was Rocky Balboa vs. Apollo Creed. After last year’s display of unbelievable drama, it was going to be tough to top the Patriots miraculous Super Bowl victory over the Atlanta Falcons. If I was going to tell you last week that the Super Bowl record for total yards, and most passing yards in a game by a quarterback were going to be completely shattered, you all would have automatically assumed that Tom Brady won his sixth ring. Well, that didn’t come into fruition. The Philadelphia Eagles defeated the New England Patriots 41-33, giving Philadelphia it’s first Super Bowl title in franchise history. Let’s go back to Week 14. The Philadelphia Eagles were on the road up against the league’s leading offensive unit (at the time) the Los Angeles Rams. Starting quarterback Carson Wentz was having an MVP-caliber type season, and was having yet another impressive game against the stingy Rams defense. After throwing a touchdown pass to give the Eagles the lead, Wentz had to exit the game due to injury. Tests would later show that Wentz had suffered a season-ending injury due to a torn ACL in his left knee. The Eagles went on to win the game and clinch the NFC East crown, but this was a tremendous blow to their Super Bowl title aspirations. Replacing Wentz would be Nick Foles. Foles had spent an earlier tenure from 2012-2014 in Philadelphia, notably in 2013 where he threw 27 touchdown passes to only a remarkable two interceptions. He had spent the last few seasons with the Rams, and the Kansas City chiefs before being scooped up once again by Philadelphia to serve as Carson Wentz’s backup. Once Wentz went down and the Eagles declared Foles the starting quarterback for the remainder of the season, nobody gave the Eagles a chance to win a playoff game. They had already lost Left Tackle Jason Peters, and Defensive Lineman Jordan Hicks, two key parts of their team. But, it was clear that these underdogs from Philadelphia were on a mission. They were determined to rewrite history. The Eagles were home underdogs in both of their playoff games leading up to the Super Bowl. Foles barely survived against the Atlanta Falcons, and it did not look like he would be up to the task against the Minnesota Vikings. The Vikings were coming off of the “Minneapolis Miracle” and were 4.5-point favorites on the road in Philadelphia. Foles needed to be better than ever to have a chance against the ferocious Vikings defense. Foles arguably played the best game of his career, and lead the Eagles to a 38-7 thrashing of the Vikings. The Eagles were going to get the opporutnity to win their first Super Bowl title in franchise history. Foles aka “Rocky Balboa,” looked ready to step in the ring against the undisputed, world champion of the world “Apollo Creed” (Tom Brady). As Mickey Goldmill (Burgess Meredith) once said, “Rock, he’ll knock your block off.” The New England Patriots were looking to repeat as Super Bowl champions. The ageless wonder Tom Brady won yet another MVP award, and was coming off an impressive win against the stingy Jacksonville Jaguars. Tight End Rob Gronkowski would be cleared from the league’s concussion protocol, and he wasn’t even active in the Patriots miraculous comeback in last year’s Super Bowl. There was no way that the Patriots were going to lose against the underdogs from Philly. Just like the movie, it was almost certain that the underdog did not have a chance. Boy, were we wrong. The Eagles came out firing. Questions were circulating all week long if Eagles Head Coach Doug Pederson’s play calls were going to be conservative early on to allow Nick Foles to settle in on the NFL’s biggest stage. These questions were answered instantaneously as the Eagles would receive the opening kickoff. Foles drove the Eagles right down the field, making some key third down conversions, and the Eagles opened the scoring with a FG. New England would then match the Eagles opening drive FG with a FG of their own to knot things up at 3. The following drive, Foles made a beautiful throw to the back of the end-zone to wide receiver Alshon Jeffery for a touchdown. After the first two Eagles possessions, you could just tell that Foles was ready to play. His throws were very sharp, and pinpointed perfectly. All night long, the Eagles and Patriots would exchange blows to each other’s skulls. This metaphorical statement would become a reality for Patriots receiver Brandin Cooks, as he left the game in the second quarter after a vicious hit to the head. Foles and Brady continued to torch the opposing defenses, finding their receivers down the field for huge chunks of yardage. The play of the night would come right before halftime. It was fourth and goal for the Eagles at the Patriots 1-yard line just seconds before half. Running back Corey Clement would take a direct snap, then reverse the ball in the backfield to Tight End Trey Burton. Burton then threw a strike to a wide open Nick Foles in the end-zone. Yes, you read this correctly. Nick Foles caught a touchdown pass from the Eagles’ number two Tight End. Eagles fans erupted, and that gave the Eagles a 22-12 halftime lead. After my man Justin Timberlake killed it during the halftime show, it was time to resume the football game. Folks, we’ve all seen this before, but once again Tom Brady would not go down without a fight. The Brady Bunch stormed down the field to open the second half, which concluded with a Brady strike to Gronkowski. The lead was now trimmed to 22-19. But, after an Apollo right hook, Rocky seemed to get right back up on his feet. Foles would then answer with a laser touchdown pass to Clement, who did a tremendous job securing possession of the ball and keeping his two feet in the end zone. This fight would go the entire fifteen rounds, and would leave just over two minutes left on the clock. Here comes Apollo Creed, looking to knock Balboa right back on the ground. The only sack of the night between both teams came at the most opportune moment in the game. With the Patriots looking to drive down the field to win the game, Eagles defensive lineman Brandon Graham swatted the ball out of Brady’s hands and slammed him to the ground. The Eagles would recover the football, and take over with just over two minutes to play. Creed was knocked down, and it looked like the underdog kid from Philly was ready to claim world champion status. Eagles rookie kicker Jake Elliot would kick a field goal to extend the Eagles lead to eight with only seventy seconds remaining. Brady might’ve just got knocked down, but this fight was not over yet. The Eagles would knock down a Hail Mary heave by Brady in the end zone, and the clock showed a double zero. 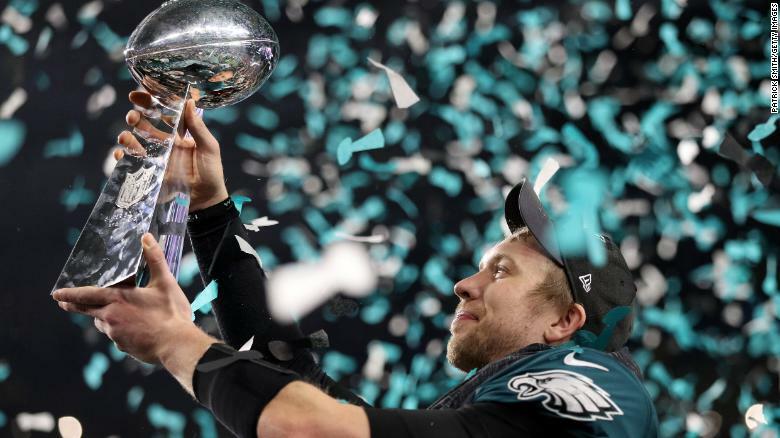 The Philadelphia Eagles, lead by their backup quarterback Nick Foles, were finally world champions of football. Balboa took down Apollo, in one of the greatest Super Bowls ever played. How can you not love the game of football? Going into the season, who would have ever guessed that Nick Foles would be named the Super Bowl MVP? Nobody in their right minds would’ve guessed that, and even leading up to Super Bowl week did a lot of people think Nick Foles could beat Tom Brady and the Patriots. The Eagles ended their 58-year championship drought, and finally won their first Super Bowl ring. If there is one thing that’s certain, Philadelphia has a new hero, but his name is not Rocky Balboa. It’s Nick Foles.